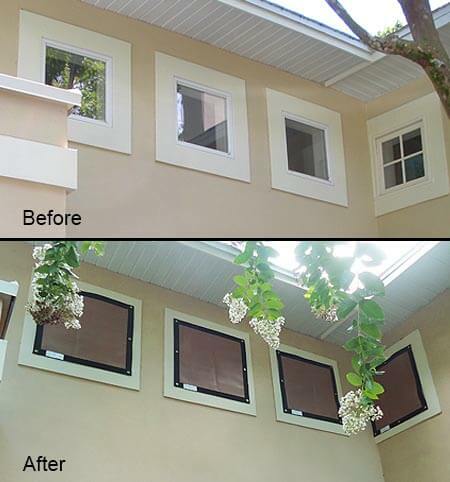 EZ-Screens are a new way of protecting structural openings with materials that will resist ultra violet rays and can withstand hurricane force winds. EZ-Screens have been selected for durability and strength, offering glass protection and are very easy to hang. See through design – eliminates “boxed” in feeling. EZ-Screens use Gore Tanara thread for all the seams. Gore warranties the seams for the lifetime of the fabric. Our seams do not degrade in strength like other products. Our product carries a 10 year warranty. If the workmanship or product fails, we will fix or replace it at no cost to you. Other companies pro-rate their warranty so they only pay 10% of the cost after 10 years. EZ-Screens use metal cam buckles that do not slip – period! Our competitors use plastic buckles that slip and do not tighten effectively. They tell the customer to tie a knot or place a grommet below the buckle to stop the attachment from loosening. You do not have to do that with our metal buckles. Give us a call today to find out the best wind screen product options that suit your needs.